Anime series that involve surreal and thought provoking concepts are prevalent, but shows that leave you physically drained after watching them are quite rare. 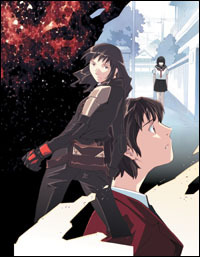 Some people have even compared Boogiepop to a similarly thought-provoking anime from a few years ago, Serial Experiments Lain. Once you sit down and watch an episode, you'll probably agree that Boogiepop Phantom is one of the most innovative animes to date. This is not only because it has a flair that hasn't been seen since Lain, but also because it is nothing like Lain. Boogiepop Phantom is, at its core, a show about the inter-related nature of people's lives and the concept that they know of as time. At the end of some episodes, the viewer will literally be sitting on their couch thinking to themselves 'What the heck was that?' while at other times they'll come out thinking 'Oh, that's how that happened!' Boogiepop, while constantly dealing with the surreal, offers glimpses into the sometimes-tragic wasteland of reality and the weave of people, souls, emotions, and thoughts that make up humanity. The concept of time, or the fractured nature in which it is represented, is the all-important guiding factors for the series. Each episode is broken down in a number of scenes that take place out of order with different characters and events within each of them. A particular scene can literally mean one thing in one episode and a totally different thing in another, simply because of the way in which it develops. To keep the viewer from being totally confused by the time changes, each episode focuses on a single character or a series of events involving a few characters. 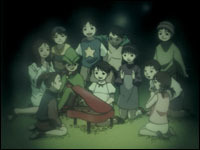 As the show progresses, events seen in the episodes tend to be recalled later on and given more clarity. Sometimes, something that was the main focus in a previous episode will show up as a small peripheral in the episode you are currently watching, and you will be suddenly jerked into remembering that all things are, in fact, interlaced. In terms of continuity, the fact is that the events are so intricately woven together that it isn't until the later episodes that the complexity of the interconnected nature of the series truly shows. And yes, it does serve to pay attention early on because things really start to come together as the show progresses. On another level, Boogiepop Phantom's characters each have a number of flaws that may cause them to be viewed as royally screwed up, but they are nothing like the basket cases that are the Evangelion pilots. No, Boogiepop's characters are simply human; all filled with hopes, dreams, regrets, remorse, sorrows, and memories. Memories, good and bad, make people want to hold onto the past and it ends up eating away at them on the inside. Much like the spiders that thrive on the knots in people's hearts, it is the resistance to change that makes people unhappy. In a roundabout way, this is the breakdown of one of the early concepts presented in the series. If you're seeking a title filled with light-hearted comedic content or something with a simple plot as mindless entertainment, you're not going to get it with Boogiepop. 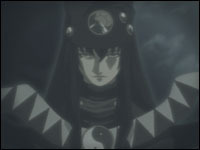 Boogiepop is a series that deals straightforwardly with some of the issues that we as humans face, and that society tends to tuck under the rug and hopes that no one sees. I mean, let's face it. A somewhat deranged and profoundly lonely man who spends most of his time playing dating sims and eventually turns to drugs to ease the suffering in his mind… this is something that can and does happen in reality. The fact that many of the issues addressed in Boogiepop are issues that are possible and extant in reality and are so taboo in nature is part of what makes Boogiepop somewhat disturbing. It's easy to hide from that kind of thing when no one talks about it, but when someone ties it up in a nice little package and puts it right in front of you, there's not much to do but face it, and you can't help but realize that the fiction has strong roots in the corporeal world. As for the plot, it's really kind of hard to pinpoint exactly what that is in the beginning. Each episode deals with a different story, a different set of characters, a different time period, and all of the episodes are somehow related in small ways. At times, there doesn't seem to be much that ties each of the stories together, but there are overlying and prevalent questions and situations that permeate the series. How does Boogiepop relate to the Boogiepop Phantom? Where do each of the characters presented fit into the overall storyline? Which information is relevant and which is extraneous? All of the people who are focused upon are a departure from the norm in one way or another. All of the characters exist in the same general location and have the same events happening in the world around them. 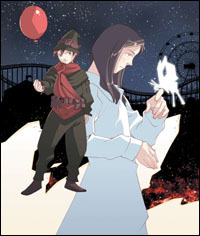 All of the happenings are related to the Boogiepop Phantom in one way or another and how the mysterious light that came from the sky changed the world, but to divulge any more would be to spoil the show for you. If you're confused during the first few episodes, don't fret - that is completely normal. As the series progresses and holes in the timeline are filled in, everything starts to slowly become more clear. The way in which the series is presented makes it seem even more realistic, in that not everything is revealed in an order that makes any kind of logical sense. Boogiepop Phantom, known in Japanese as Boogiepop Wa Waranai (Boogiepop Doesn't Laugh) is voiced by a group of talented seiyuu. Asakawa Yuu (Aoyama Motoko - Love Hina; Shiris - Record of Lodoss War) is the voice of Nagi Kirima. Toka Miyashita is given her voice by the well-known Shimizu Kaori (Iwakura Lain - Serial Experiments Lain). Asano Mayumi voices the Boogiepop Phantom. The English dub cast is equally talented. Rachael Lillis (Utena - Revolutionary Girl Utena; Misty - Pokemon) is the English dub voice of Nagi Kirima. Debbie Rabbai a.k.a Angora Deb (Ayane - Ayane's High Kick; Female Maze - Maze; Aika - Agent Aika) gives Toka Miyashita her English voice. Simone Grant (Neese, Karla - Record of Lodoss War) voices the Boogiepop Phantom in the American dub. 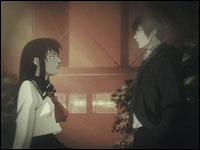 Boogiepop Phantom DVDs feature not only Japanese and English Dolby 2.0 audio tracks but also a Dolby 5.1 English track as well as a director's commentary track that runs through the entirety of each DVD. The inclusion of a commentary track does put it in a category all it's own that only a few other companies have delved into. Yet, unlike other anime commentaries, Boogiepop's commentary goes beyond simple dubbing talk and actually helps to give a greater understanding into the entire adaptation process and to the show as a whole. In fact, some of the dialogue that is presented helps to bring out some of the imagery that would otherwise be lost to the viewer even on the second viewing. Overall, this series is deeply introspective and somewhat disturbing at times, but it's worth the thinking that's involved. Once all is said and done, Boogiepop Phantom will leave you with a number of impressions. As we mentioned before, these can be best summarized by Manaka when she mimics Ichiro in episode 8 by saying, "What the hell was that?" Once you've watched more of the series you'll be left with expressions like, "oh, that's what that was...."
A freelance writer who begins tagging along with Nagi to research her father's work. He ends up getting in over his head in a much bigger mystery when he discovers the weird events Nagi is trying to solve. Ichiro also bears a striking resemblance to someone Nagi knew during her time in the hospital and because of this they have a bit of an attraction to one another. Toka is an outgoing girl who has a lot of close friends and a number of acquaintances. She is very indifferent at times, but she does help guide people in the right direction when they need help.